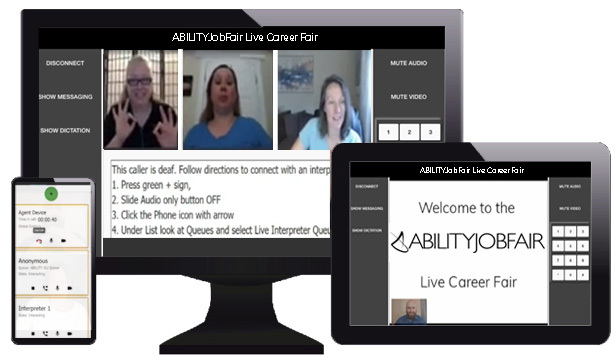 With the support of abilityJOBS and ABILITY Magazine, ABILITY Job Fair presents an accessible face to face video career fair technology to corporations, governments and non-profits so that they may actively recruit candidates in the most human and efficient way available. This is the first platform to emulate the live career fair experience accessible for job seekers with or without disabilities. For many people that are deaf, English is their second language. Sign language is their first. Reading is sometimes not fully comprehended and is much, much slower than using full sign language to actively engage in a conversation. Text messages, writing notes back and forth or projected captioning are done in a second language, which a person may need more time to fully comprehend. Therefore, using sign language during a job review is critical. View EEOC lawsuits against businesses not providing interpreters during interviews. Note: Think if you learned a second language in school, and then on a job interview you're told "today we'll only speak in that second language." Provide a better way for job seekers to engage in online career fairs. Job Seekers can attend from anywhere there is a browser with internet connection. The platform is a user friendly, browser based experience with no need for downloading special software. Organizations now have another resource to make meaningful recruitment connections to persons with disabilities. This user friendly and browser based application requires no unnecessary downloads. The only requirements are an internet connected device with webcam and microphone and a Chrome or Firefox browser.